Class of 2021, Setter, Sky High 16 Black, #22, Jenna Brown. 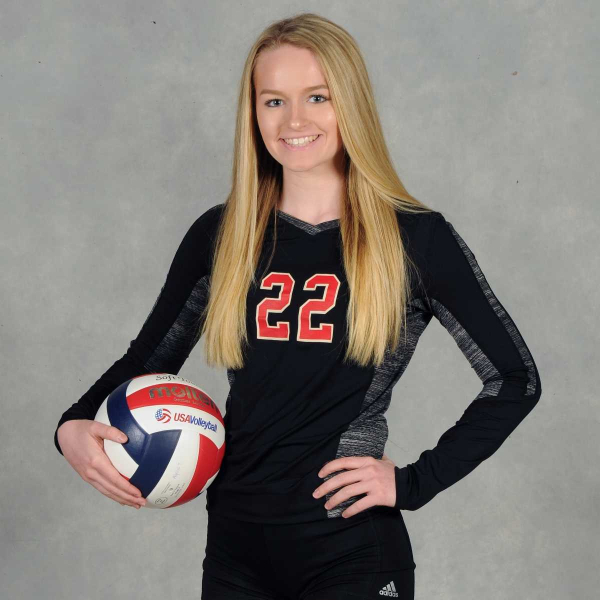 Video clips from 2019 Nike Mid-East Qualifier (MEQ). Competing in 16 OPEN. Class of 2021, Setter, Sky High 16 Black, #22, Jenna Brown. 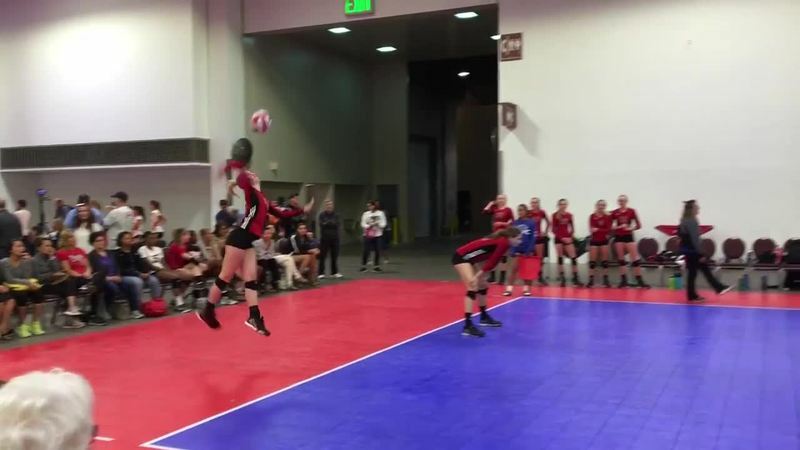 Video clips from 16 Elite at Triple Crown FEB 16-18. Reel #2. 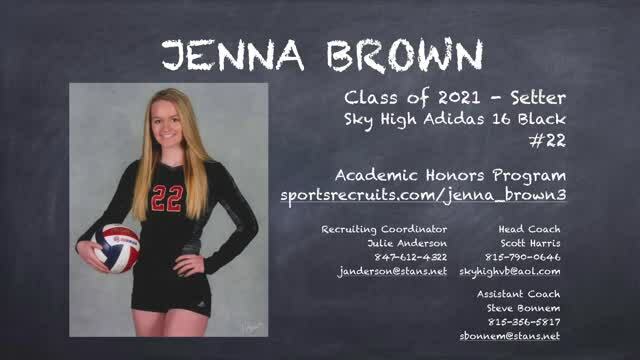 Class of 2021, Setter, Sky High 16 Black, #22, Jenna Brown. Video clips from Pool A play FEB 23 & 24th. Competing in Windy City Power League 17/18 OPEN. Class of 2021, Setter, Sky High 16 Black, #22, Jenna Brown. Video clips from FEB-2019. Competing in Windy City Power League 17/18 OPEN. Jenna Brown #22. Setter. Class of 2021. Adidas Sky High 15 Black. 2018 Northern Lights Qualifier (NLQ) - 15 OPEN Champions. More to come at USAV Nationals in Detroit - 15 Open - Triple qualified. 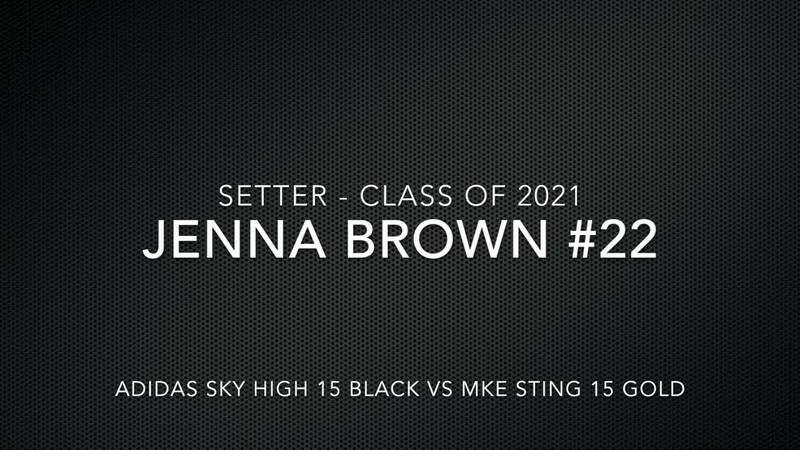 Jenna Brown #22. Setter. Class of 2021. Adidas Sky High 15 Black. More to come at USAV Nationals in Detroit - 15 Open - Triple qualified. Jenna Brown #22. Setter. Class of 2021. Adidas Sky High 15 Black. Stepped in for Karina Simatos to play Libero for two days of play at the Great Lakes Power League. More to come at USAV Nationals in Detroit - 15 Open - Triple qualified. Jenna Brown #22. Setter. Class of 2021. Adidas Sky High 15 Black vs. Milwaukee Sting 15 Gold. Jenna Brown #22 back sets Jenna Splitt #6 to open Set 2 with a statement. More to come at USAV Nationals in Detroit - 15 Open - Triple qualified. Jenna Brown #22. Setter. Class of 2021. 2018 Windy City Qualifier - 15 OPEN. 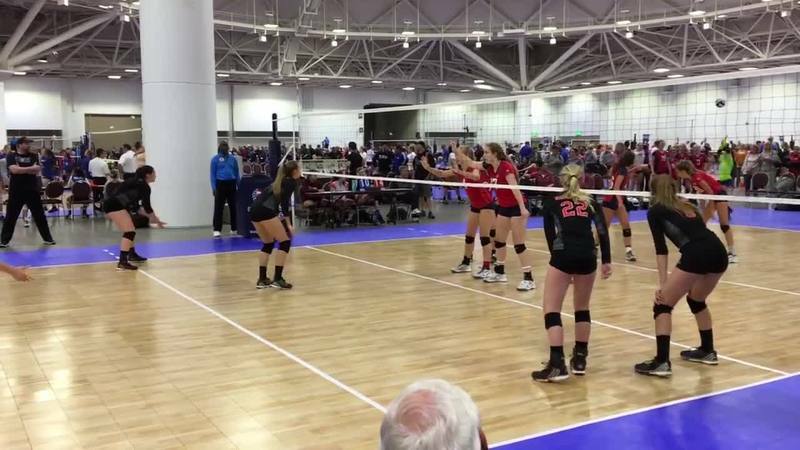 Adidas Sky High 15 Black match point vs. SkyLIne in the Gold Bracket semi-final. Team point, Team win. Jenna Brown #22. Setter. Class of 2021. Great Lakes Power League 16 Super Open and Triple Crown 15 Elite. Jenna Brown #22. Setter. Class of 2021. Great Lakes Power League 16 Super Open - January, 2018. 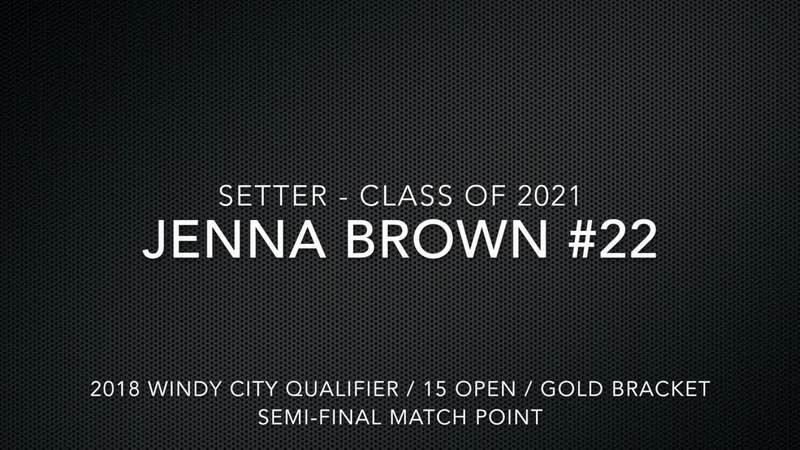 Jenna Brown #22. Back Set for the assist and the kill by one of our Lefties. 2017 USAV Girls' Junior National Championships. 14 Open. Sky High Adidas 14 Black. 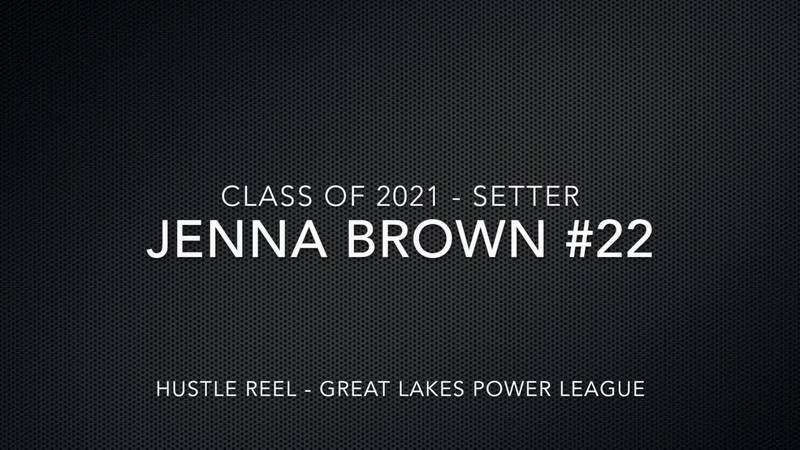 Jenna Brown #22. Transition from Serve to Set. Cover the court to make the Set. 2017 USAV Girls' Junior National Championships. 14 Open. Sky High Adidas 14 Black.